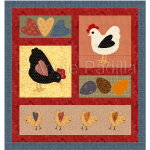 A quick and fun design, this appliqué chicken sits on a pieced background and the chicken wire is part of the quilting design. Make one, or two, or as many blocks as you would like for a cute wall hanging! 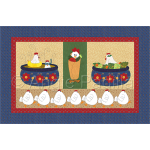 Please note: this pattern is for a combined pieced and applique block only, and NOT for a quilt pattern. 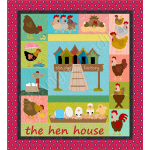 Block size: 8 x 6"
If you're looking for a quick little project, this one fits the bill. Perfect for the chicken coll..